What do you believe God thinks of you? If you could change one thing about the way you see your value, what would it be? 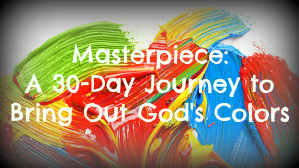 How committed are you to becoming God’s masterpiece? Gems are beautiful, shiny, and full of colors. They’re valuable, but their true value is not determined by a gemologist. You are like a gem, and no one but God can determine your value. God didn’t mess up His design of you. He’s God, and He’s incapable of messing up. He created you in His image. You have His imprint on you. You can distort the image He’s placed on you by the way you live, but you can’t eliminate the image of God within you. No matter what you do, you cannot veer so far from God that He cannot reach you. You can never completely eliminate the image with which He’s created you. You’re designed from the inside out. When you neglect or refuse to acknowledge the worth God has given you—whether you inflate or deflate yourself—you are trying to say you know more about how you’re made and who you are than God does. You’re wrestling God for authority. And you will lose that wrestling match every single time. God decides your worth, and He thinks you’re worth sending His only Son to die for you. Yes, God sees your shortcomings, but He sees them only in the context of your potential. He knows the possibilities with which He created you, and He will continually strive to guide and mold you to your completion. When you don’t acknowledge His will and your value, you miss out on a piece of His plan, which is exactly what He doesn’t want you to do. Let Him show you your value. Fully live as He intends. This is it: the wrap up of our 30-day devotional journey. But it’s not an ending. It’s a continuation. God is still working in your life. He desires your faith and trust. He wants you to know Him and follow Him well. Stay committed to Him. Trust His work in your life. You are becoming a magnificent masterpiece. Posted on May 19, 2015 March 24, 2015 by SusanHLawrencePosted in MasterpieceTagged beauty, daily devotional, God's creativity, masterpiece, Purpose, spiritual growth, spiritual journey.